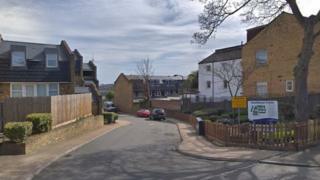 A man believed to be in "his late teens" has been shot dead in south London. Emergency services were called to Friar Mews in West Norwood at about 16:10 GMT. The victim was pronounced dead at about 16:45. Officers have arrested two males on suspicion of murder. They have been taken to a south London police station for questioning, according to the Metropolitan Police. The victim is yet to be formally identified and a post-mortem examination will be scheduled in due course.